This report summarizes the results of an ambitious three-year ethnographic study, funded by the John D. and Catherine T. MacArthur Foundation, into how young people are living and learning with new media in varied settings—at home, in after school programs, and in online spaces. It offers a condensed version of a longer treatment provided in the book Hanging Out, Messing Around, and Geeking Out (MIT Press, 2009). 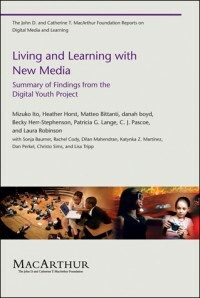 The authors present empirical data on new media in the lives of American youth in order to reflect upon the relationship between new media and learning. In one of the largest qualitative and ethnographic studies of American youth culture, the authors view the relationship of youth and new media not simply in terms of technology trends but situated within the broader structural conditions of childhood and the negotiations with adults that frame the experience of youth in the United States. The book that this report summarizes was written as a collaborative effort by members of the Digital Youth Project, a three-year research effort funded by the John D. and Catherine T. MacArthur Foundation and conducted at the University of California, Berkeley, and the University of Southern California.